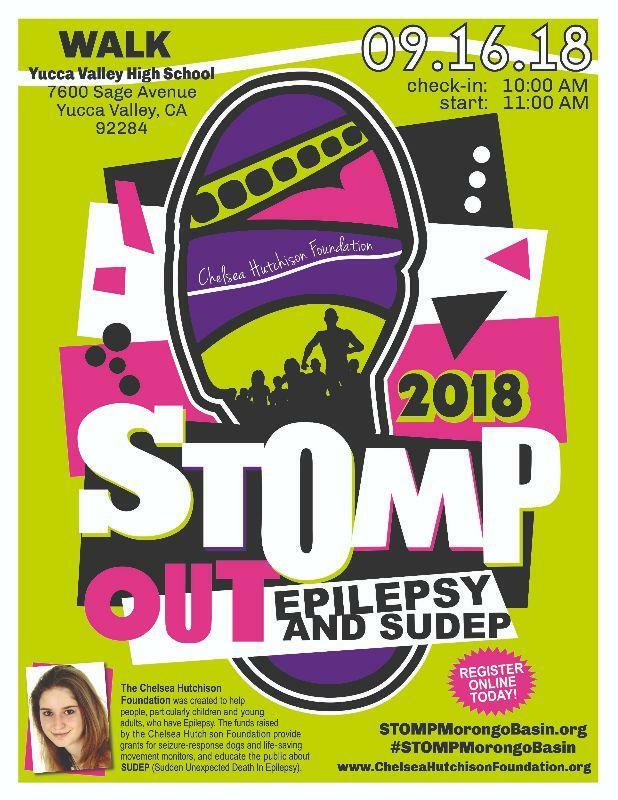 Join us at Yucca Valley High School on September 16, 2018 to STOMP Out Epilepsy and SUDEP at an Awareness Walk/Run. Fee guarantees an event tshirt if registering before August 15, 2018. We always order extras, but after that, tshirts and tshirt sizes are subject to availability. Walk Day Registration is $35 Adult (13 and up) and $20 Children (7-12). Service dogs are welcomed and encouraged. Stay up to date on details by joining our Facebook event page! Funds raised through this event provide funding for fully-trained seizure-response dogs, life-saving movement monitors for those in need and grant wish trips to Epilepsy Awareness Expo and Day at Disneyland. Want to fundraise to help CHF with their mission? Scroll down for details on fundraising and some wonderful rewards for those who do. **In addition, the top overall fundraising individual (all STOMPS combined), raising a minimum of $2,500, will receive an all-major expenses paid trip to Epilepsy Awareness Day at Disneyland in November, 2018 ($2,500 value). See below for details. The Chelsea Hutchison Foundation grants comfort and hope to those affected by epilepsy through providing monitoring resources, vital information, and a safe haven for conversation and community.Our main goal is to raise awareness of SUDEP and to make a positive difference in the lives of individuals and families living with epilepsy.We raise funds to provide education about SUDEP and to provide seizure response dog grants, (what we believe to be) lifesaving movement monitors that help to protect against SUDEP and grant wish trips to Epilepsy Awareness Day and Expo at Disneyland.We stay up-to-date on current trends in medical technology in order to be able to provide the most effective devices as they become available.We respect the value and quality of life of every person living with epilepsy.We are dedicated to providing opportunities that allow individuals and families greater independence, increased confidence, ability to enjoy social environments, and community understanding. Fundraising closes at 11:59 PM on September 30, 2018. ** This package includes airfare for up to 4 (Continental US only), 4 night's lodging at Homewood Suites (November 5-8, 2018), breakfast each morning, light dinner each night at the hotel, Meet and Greet, tickets to Disneyland for up to 4 on Epilepsy Awareness Day (November 7) and to California Adventure Park (November 8), round-trip transportation between CA airport and the hotel. *Entertainment, drawings, food and festivities immediately afterwards.